Mature microRNAs (miRNAs) are single-stranded RNA molecules of 20–23-nucleotide (nt) length that control gene expression in many cellular processes. These molecules typically reduce the translation and stability of mRNAs, including those of genes that mediate processes in tumorigenesis, such as inflammation, cell cycle regulation, stress response, differentiation, apoptosis, and invasion. miRNA targeting is initiated through specific base-pairing interactions between the 5′ end (“seed” region) of the miRNA and sites within coding and untranslated regions (UTRs) of mRNAs; target sites in the 3′ UTR lead to more effective mRNA destabilization. Since miRNAs frequently target hundreds of mRNAs, miRNA regulatory pathways are complex. 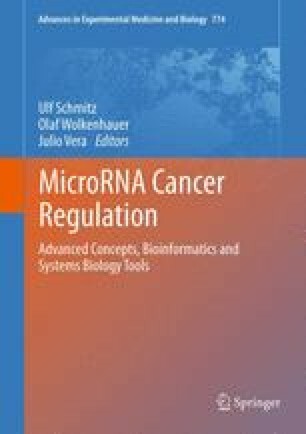 To provide a critical overview of miRNA dysregulation in cancer, we first discuss the methods currently available for studying the role of miRNAs in cancer and then review miRNA genomic organization, biogenesis, and mechanism of target recognition, examining how these processes are altered in tumorigenesis. Given the critical role miRNAs play in tumorigenesis processes and their disease specific expression, they hold potential as therapeutic targets and novel biomarkers. T. T. is cofounder of and scientific advisor to Alnylam Pharmaceuticals and scientific advisor to Regulus Therapeutics. We thank Iddo Ben-Dov for sharing his unpublished data and Miguel Brown and Aleksandra Mihailovic for assistance with figure generation. We thank Markus Hafner, Kemal Akat, and Neil Renwick for their help with editing the manuscript. T.F. is supported by Grant #UL1 TR000043 from the National Center for Research Resources and the National Center for Advancing Translational Sciences (NCATS), NIH. J.I.H. is supported by the Deutsche Forschungsgemeinschaft. T.T. is an HHMI investigator, and work in his laboratory was supported by NIH grant MH08442, RC1CA145442 and the Starr Cancer Foundation. We apologize to those investigators whose work we could not cite due to space constraints.